To enable Gradebook Passback, you'll have to enable OneRosterAPI in your Infinite Campus configurations. 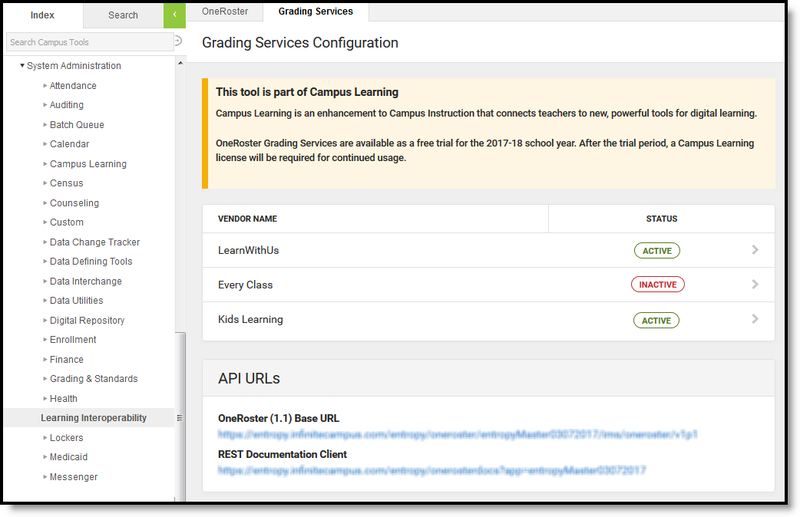 The Grading Services tool allows districts to enable connections to grading services partners through the OneRoster API. 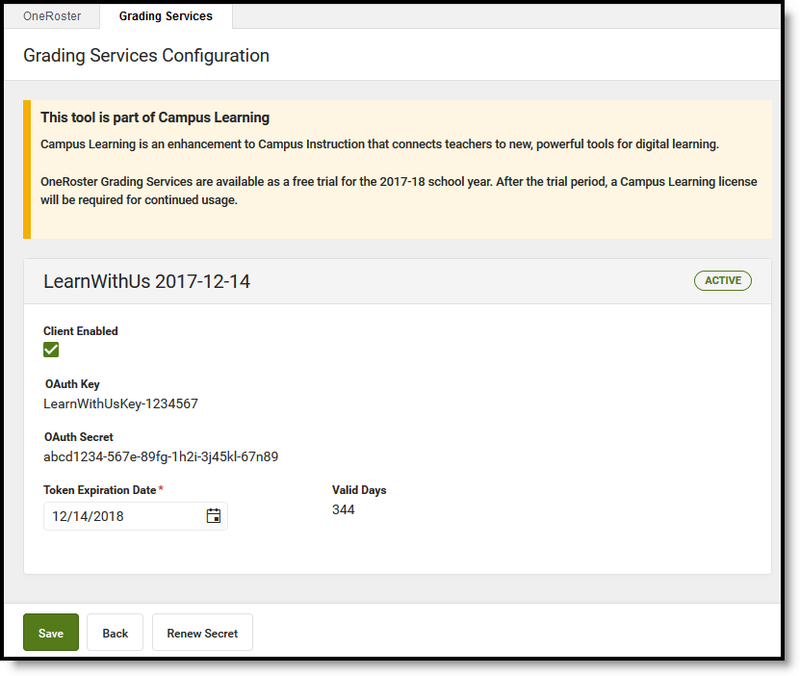 Grading services connections allow Otus to request section and roster data from Campus and send assignment, score, and grade data to Campus. Have a Status of Active. Receive the Key and Secret from your district. To enable Otus, click Otus and mark Client Enabled. Save the record to make Otus active. Copy the Oauth Key and Secret and share with your Otus technology coach - this information allows us to connect to your district and make data requests. Also share the API URLs with your tech coach. Be sure to share this information with your Otus tech coach, otherwise gradebook passback won't be enabled. By default, the Key and Secret expire after one year, as indicated by the Token Expiration Date. Update this date if desired. Click Renew Secret at any time to generate a new key and secret to send to us. Otus will not be able to connect to Campus until we receive the new Key and Secret. to use for retrieving Campus data. The OneRoster (1.1) Base URL is the URL vendors use to access Campus. The REST Documentation Client URL links to the REST documentation client, which documents the API and allows users to review endpoints and retrieved data. Grading Window must be open for the Task/Standard. Traditional Grading/Grading Tasks- If only a Percent is provided, Campus matches the value to the correct score in the Score Group aligned to the Grading Task, based on the minimum percent values entered for the Score Group. Unique Minimum Values must be entered for Score Group items.If only a Score is provided, the percent reports as null. Reported scores must exist in the aligned Score Group.If both a Percent and Score are provided, the score is not determined using the minimum percent. Standards-Based Grading/Standards- If only a numeric value is provided, Campus matches the value to a score based on Power Law values or rubric item sequence. The numeric value must either be within the Power Law range or match the sequence of a rubric item.If only a Score is provided, the numeric value reports as null.If both a numeric value and a Score are provided, the mapping between the two is not enforced. When a teacher receives assignments from an LMS, they must select categories and grading alignments for those assignments so that grades can be reported. The Uncategorized Assignments article provides instructions to teachers for completing this process. Once pass back is configured, any assessment that is Assigned on or after the start date will be passed back to Infinite Campus. If you would like to prevent an assignment from being passed back after removing the grade from IC, you can choose to Not Include the Grade in the final grade, or remove the assignment from Otus. If it was assigned prior to the start date, it will not be passed back.